BlackBerry PlayBook $500 at Office Depot | BlackBerry Blast! Will the BlackBerry PlayBook sell for the same price as the iPad? That seems to be the plan if you trust the leaked screen shot. This leaked internal Office Depot screen shows the BlackBerry PlayBook offered for $499.99. Can they compete head to head with the iPad like that? The leaked shot also reveals an in-store date of "week 17." 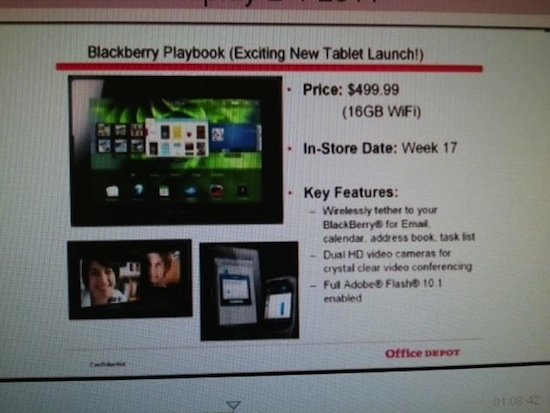 If that is correct we can expect the BB PlayBook to show up in Office Depot sometime in late March. Neither RIM or Office Depot has confirmed the release date or price, but this looks legit. Stay tuned.